How to Design Motif Pattern. Designing of motif pattern is a creative process. It means that you have to get rid of stereotypes. You don't need anyone's pattern to follow it stitch by stitch. 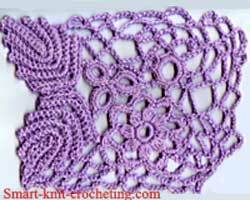 Complete freedom of imagination and fantasy are the things which make from the first glance scary process of creating Irish crochet patterns a possible thing. 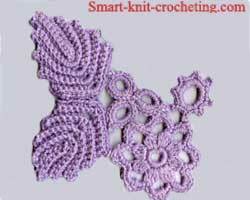 There are a few techniques which allow to create quite complicated and intricate crochet patterns by joining separate motifs together. Information about sewing motifs, using "Join-as-you-go" method, and filling a space between large motifs with additional small motifs-inserts can be found at Crochet Motifs page. Technique of creating motif patterns with the help of a crocheted net presented on this page was introduced by a talented Ukrainian designer Antonina Kuznetsova. It is based on the classical Irish crocheting but at the same time it is something new not only by its look, but by those numerous technological "how-to", which turn an old thing into something completely new also. 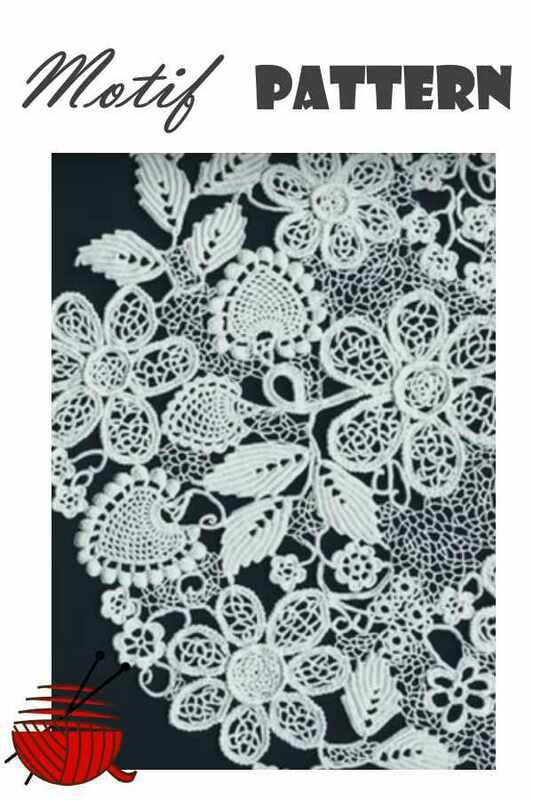 Classical Irish laces consist of the separate motifs which are embedded into a crocheted net. In most cases they are made of cotton or silk and look so delicate that the most proper place for them is a museum or some art exhibition. It is a kind of garment you certainly won't use as an everyday dress. Let's look at some Tonya's updated Irish crochet technique designs at her Flickr page. They are alive. They are beautiful, but at the same time pretty practical and casual. Can you imagine yourself dressed in this kind of dress? Looks too complicated and impossible for you to do it? For this occasion always try to keep in mind a good saying: "Eyes are afraid, but hands just do it". I'll tell you more. My experience in crocheting began many years ago when I was 10 - 12 years of age, but I have never tried to crochet any Irish style motif patterns. Let's start together. For demonstration purposes, I took 1.7 mm steel hook and not very fine yarn (not the best choice for this kind of crocheting!). Just to try whether it works for me. It works!!! It will work for you also. Don't give up! Our first step is to make a small "island" of Irish crochet. That's how every motif pattern begins after you choose the kind of motifs you are going to use for your project. It is a creative process. Crochet motifs can be pinned or sewing with a few stitches to a few plies of fabric, pillow, or you can just put them on your lap. Net and motifs have to look flat together. Don't destroy their flatness crocheting connecting net elements either too short or too long. There is no correct or incorrect way or direction of crocheting net. 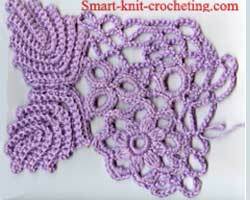 Use chains, double, treble crochets, change direction of crocheting, and whatever allows to keep your small project flat. Here is the way these islands of pattern were made. 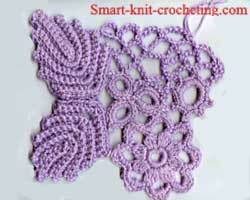 Charts for motifs (# 2, 5, 9, and 12) are taken from Irish Crochet page. Using the same color but thinner thread, sew motifs from the wrong side at a few points to each other. Don't cut thread at each point. Just pool it accurately inside motif from one point to another. Crochet cells of net using chains, double or treble crochets. Connect them to motifs or each other inserting the hook under the two loops. A net is formed at the right part of crochet motifs. A net is formed at the bottom part of crochet motifs.